If you want a fun but also a bit mean mother’s day present then how about this World’s Okayest Mom t-shirt. The t-shirt is available in many colors and in sizes Small – 2XL and they are made from 100% cotton. 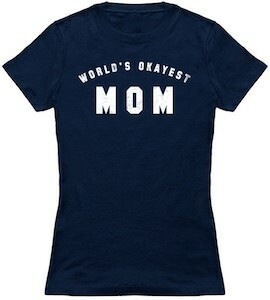 On the t-shirt, it simply says “World’s Okayest MOM” and sure that can be funny if your mom likes this kind of humor otherwise it could be pretty mean so think about it before surprising your mom with this special t-shirt. No need for a card this year because this t-shirt your mom can keep wearing over and over and she will know that you really like her because you got her this crazy t-shirt.